BLOOMFIELD HILLS, Mich. — Works of art are built into and scattered throughout the labyrinthine hallways, assorted offices, and public and private chapels of Christ Church Cranbrook. Among them are a jaw-dropping floor-to-ceiling fresco by Katherine McEwen in the main chapel, an original William Morris wall tapestry in the library, a preponderance of astonishing Arts and Crafts decorative elements by master craftspeople, and stained glass designed by G. Owen Bonawit. Endowed by the same benefactors that funded the original Cranbrook Educational Community (now encompassing Cranbrook Schools, Art Academy, Art Museum, Institute of Science, and Cranbrook House and Gardens), George and Ellen Booth, Christ Church houses selections from their expansive art collection that consider religious themes, as well as commissions for the space. Whether or not one feels the animating religious sentiment of these works, their beauty and the profound skill attendant in their making cannot be denied. Yet none of them fall outside the range of expectation, in terms of what might be on display in a historic place of worship. But downstairs, in the tiny Chapel of the Resurrection, the story changes. Surrounded by historic architectural features, ornate inlaid floor motifs featuring symbols of the Resurrection, references to sacred geometry, art deco fixtures, and a pair of angel candlesticks that date back to Medieval times, lies a sepulcher of a distinctly modern cant. An unadorned, bespoke structure in dark material forms the vessel for the body on display, which glows with a gentle, radiant white light — for the body, rather than being viewed through glass in the traditional manner, is projected within a series of four 47” LED televisions. The internal glow of the piece, heightened by candles, illuminates the room, while soft, repetitious tones play in subtle variations, enhancing the venerated hush of the space. 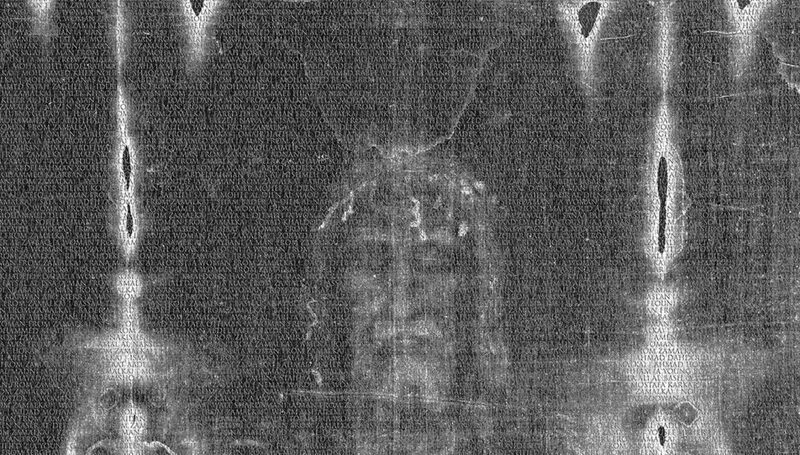 Within the four cells of the sepulcher, the images shifts from one cohesive body — a photo-negative of the iconic image of Christ in the Shroud of Turin — to a rotating series of media images of Syrian refugees, captured in the midst of the traumatic civil war, displacement, and flight from Syria that has gone on since 2011. This is “Lamentation for the Forsaken,” a 2016 work by Michael Takeo Magruder, which has come, perhaps unexpectedly, to find a place here at Christ Church Cranbrook.